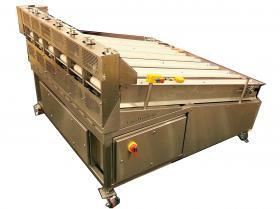 Continuous chopper for Home Style corn chips, flour chips, pita chips, etc. Continuous inline production, no handling needed. Two to eight rows, 6" round product. Other product sizes available. Ideal for cutting corn tortillas, flour tortillas, pita bread, flat bread, etc. Huge savings in production time and labor costs. Cutting options: Trangle, Rectangle, Strips, or your own design. Easy change overs with modular cutter assembly. 500 to 8,000 Dozens per hour.